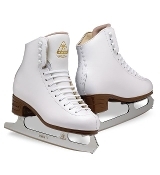 The most important part of a beginning to figure skate is to get the right equipment. 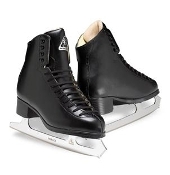 Kinzie's Closet can help with choosing the right skate for you. Check out our Skate Comparison Chart to help select the correct skates for your skating level. Everyone who has figure skated has had to start from the beginning. That is why it is so important to get the right beginner skates for your skating level. 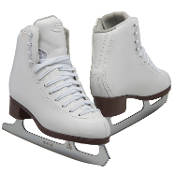 Jackson skates and Riedell skates are the most popular beginner skates. 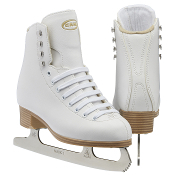 Edea Motivo Mens Figure Skating Boots are premium recreational figure skates for beginner skaters. 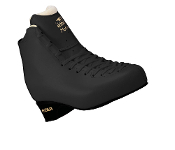 Edea Motivo Womens Figure Skating Boots are premium recreational figure skates for beginner skaters. 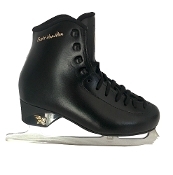 Edea Overture Mens Figure Skating Boots are a premium advanced beginner figure skating boot. 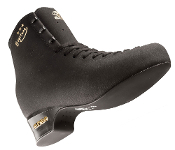 Edea Overture Womens Figure Skating Boots are a premium advanced beginner figure skating boot. GAM G0111 Stella Girls Figure Skates are for beginner and recreation figure skaters. Risport Scott Hamilton Boys Figure Skates are quality instructional beginner skates. GAM Pirouette G0170 Womens Figure Skates - Clearance! 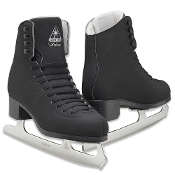 For beginner and recreation figure skaters. 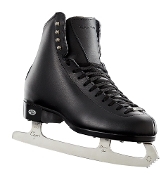 Jackson JS1792 Artiste Mens Figure Skates are a premium beginner level ice skate. ISI Tot 1-4 Pre-Alpha, Alpha, Beta. 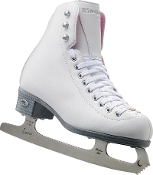 Jackson Excel JS1290 Womens Figure Skates. A good recreational figure skate for beginner skaters. 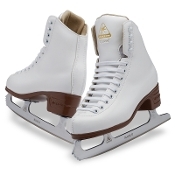 The Riedell 133 Diamond Mens Figure Skates has great features. Maintenance free PVC sole unit and Dri-Lex lining keeps feet dry. Riedell 33 Diamond Boys Figure Skates. Maintenance free PVC sole unit and Dri-Lex lining keeps feet dry. Jackson JS1490 Mystique Womens Figure Skates are premium recreational figure skates for beginner skaters. Jackson Softskate Plus JS181 Girls Figure Skates . 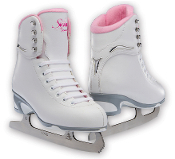 Beginner figure skates for girls. Jackson JS1491 Mystique Girls Figure Skates are premium recreational figure skates for beginner skaters. Jackson JS1592 Mystique Mens Figure Skates are premium recreational figure skates for beginner skaters. Jackson JS1593 Mystique Boys Figure Skates are premium recreational figure skates for beginners. Jackson JS1595 Mystique Toddler Boys Figure Skates are premium figure skates for beginner skaters. Jackson JS1790 Artiste Womens Figure Skates are a premium beginner skate. Jackson JS1793 Artiste Boys Figure Skates Jackson JS1993 Marquis Boys Figure Skates - Clearance! Jackson JS1793 Artiste Boys Figure Skates are a premium beginner level ice skate. 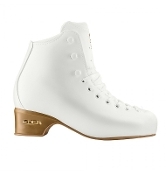 Riedell 114 Pearl Womens Figure Skates. The 114 Pearl shimmers with style. Light support with double synthetic reinforcement. 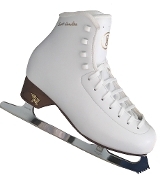 Riedell 14 Pearl Girls Figure Skates shimmer with style. Light support with double synthetic reinforcement. Riedell 119 Emerald Womens Figure Skates. Light support with double synthetic reinforcement. Riedell 119 Emerald Mens Figure Skates. Light support with double synthetic reinforcement. Riedell 19 Emerald Girls Figure Skates. Light support with double synthetic reinforcement. Riedell 19 Emerald Boys Figure Skates. Light support with double synthetic reinforcement. Risport Scott Hamilton Girls Figure Skates are quality instructional beginner skates. Riedell skates is the only brand that makes beginner level skates in a wide width. Young beginner skaters under the age of 5 typically have wider feet. 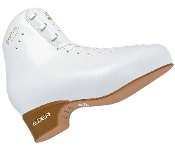 Riedell understands this and makes their beginner skates with a comfortable fit for young skaters. Jackson beginner skates are great for all age levels. 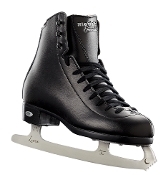 Mens Jackson beginner skates like the Jackson Excel and the Jackson Mystique are great for recreational beginner skaters. The womens Jackson artiste js1790 and the womens jackson dj2130 elle are great beginner skates for skaters taking classes and needing more support to learn more complicated skills. The girls Risport Venus and Risport Antares are great beginner skates made in Italy and arrive with the blade attached. 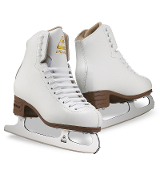 When you begin to skate, you will also want padding to help make falls softer. Beginner skaters typically fall forward on their knees and backwards on their bottoms. Having the correct padding for beginner skaters can make all the difference in making their beginning skating experiences good ones.